Take off to the Great White North where we prowl around with an animal expert to learn all we can about polar bears! But first, let’s introduce our guest for this episode! Adam Morris is a wildlife and environmental toxicologist, working as a “postdoctoral fellow” on campus at Carleton University in Ottawa, Ontario. He works with Environment and Climate Change Canada (like the EPA in the United States). His two main projects are studying polar bear health and how the considerable number of organic contaminants found in the bears is affecting their physiology and, how climate change affects the long-term trends of contaminants of concern in seabirds, fish, polar bears and caribou. He’s also heavily involved in outreach, education and scientific training of the Indigenous people of the Arctic. During his PhD, he studied the polar-bear ringed seal food chain (including those animals, fish, plankton, algae and water) as well as the caribouand wolf food chain, how contaminants like pesticides and industrial chemicals like plasticizers and flame retardants are accumulated in those animals, and how the ecology of the food chains works. He traveled all over the Arctic to get samples and work with the Indigenous people in their communities – ski-doing all over the sea-ice, hunting seals, fishing, sampling water, etc. He even fulfilled his childhood dream of researching sharks, when he got a chance to see Greenland sharks during a sampling trip on Eastern Baffin Island. You can find him on Twitter at @adamdmorris! Adam, Paul and Donna had a super time recording this episode, we hope you enjoy it! Here’s a great video about the Secrets of Polar Bear Fur! Video courtesy of YouTube user Fantastic Animal. Transluscent fur, invisible to thermal imaging? 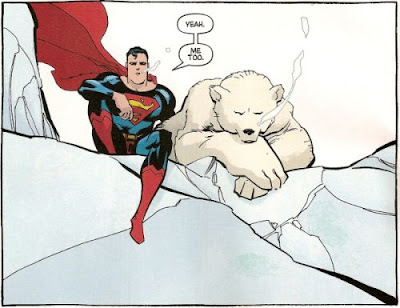 Polar Bear SUPER POWERS! Guess what, polar bears might be communicating with their stinky ol’ feets! Wow! Check out this great article about it courtesy of BBC Earth! Polar bears and penguins partying together in Coca Cola commercials are cute but make Paul’s head hurt. Why? Penguins and polar bears do not live anywhere near each other on our big blue marble, the Earth. The commercials are still CUTE as heck though. Video courtesy of YouTube user Coke polar bear commercials. Is the bear hallucinating the penguin, or vice-versa? Ice Bears in the His Dark Materials trilogy by Philip Pullman are based on polar bears! Here’s a video clip from the movie The Golden Compass, for your enjoyment! Video courtesy of YouTube user LeGrandeBoss. Because polar bears are cool. Here’s a great documentary that is coming up this winter where you can learn about polar bears and a lot of other arctic amazing-ness. Check it out courtesy of The Breaking Ice. Now you know a bit more about polar bears than you did this morning! What’s your opinion on them? We want to hear from you! Send us your suggestions for animals you’d like to hear us talk about, volunteer your rugrat to say something on our podcast, or just drop us a line about anything at varmintspodcast@gmail.com! We might even read your fascinating email on the show. Blazing Caribou Studios Donna Hume Paul Csomo Polar Bears Varmints!